Many Christian denominations observe Lent, which begins this week on Ash Wednesday. The season will conclude on Easter Sunday, around six weeks from now. Lent lasts for 40 days, actually 46, but Sunday’s are not counted. Sunday represents the resurrection, so Christians choose to not fast or perform penance on the Sabbath. Before embarking on his public ministry, Jesus prepared himself by fasting in the desert and was subject to various temptations. Christians follow Jesus’ lead and set aside Lent for prayer, charity, and fasting. From my childhood, I remember Lent as a penitential time—giving something up; like soda or candy. Many people still give something up, but others focus on Prayer, Service, Giving, or Learning. Just like spring brings new life, this is a chance for creativity with your Lenten commitment. Unlike Christmas, the date for Easter changes each year because it’s determined by the lunar calendar. Generally, Easter falls on the first Sunday following the first full moon after the spring equinox. This year, Ash Wednesday is February 18th and the Lunar New Year, a celebration in many Asian countries and the start of the Year of the Sheep, begins the next day. As we deal with another winter storm, imagine six weeks from now. Spring, harbinger of new life, will be bursting into consciousness with bulbs blossoming and trees budding, in contrast to the current state of frozen ground and icy temperatures. Is there one action you are willing to commit to? Can you find someone to hold you accountable for achieving it? 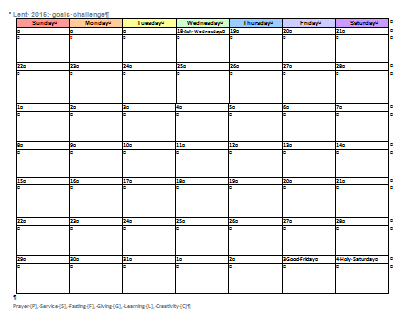 If you’re interested in getting a copy of the Lent 2015: goals challenge calendar, email me greyjs@gmail.com for a copy. I always look forward to Lent, because for some reason I find myself more committed to maintaining my spiritual journey at this time. Pope Francis has suggested that we Catholics give up indifference this season. This idea resonates with me. I see the potential for a vast ripple effect of goodness as we strive to recognize and acknowledge Christ in each person we encounter on our way. I know also that practicing mindful caring will improve my relationship with others and with God. Pray for me as I take this next step on my path!